It's the beginning of school and it is HOT here in the Midwest. I mean excruciatingly hot! We only have AC in selected areas of our building and apparently the math department does not rate AC! 2) Limits Card Sort - This activity is by Emily Hasty. I purchased this activity last week - I haven't tried it yet, but I intend to try it before my students take a limits quiz. 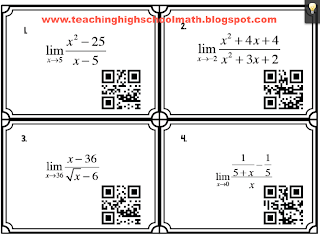 The basic idea is that students will get a formula for a piecewise function along with 18 cards. They have to figure out which 6 of the cards go with their function. The cool thing is that each card is lettered. If they pick the correct 6 cards, the cards spell a word so the teacher can easily check to see if they have chosen the right 6 cards - cool idea! 3) Limits Joke Worksheet - This activity is by MrsCookKHS. The best part - it's FREE! This is a great review for limits. 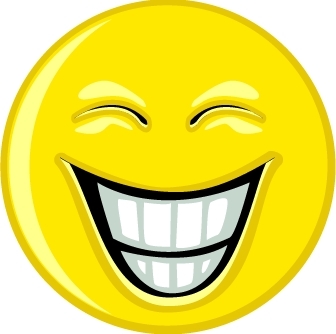 Students work the problems - then if they work them correctly, they reveal a funny joke. 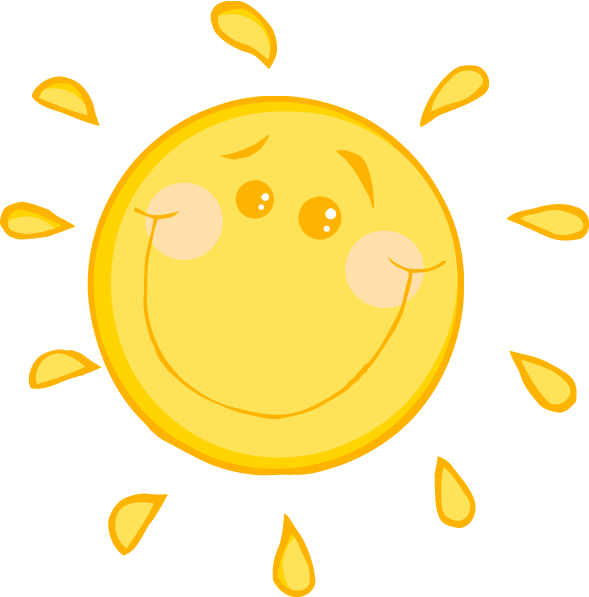 Hope you can find something that will keep everyone working through this horrible heat! I have been wondering whether my Geometry Honors class would like the idea of an interactive notebook. Ughhh...too much gluing - why are we doing this, etc? 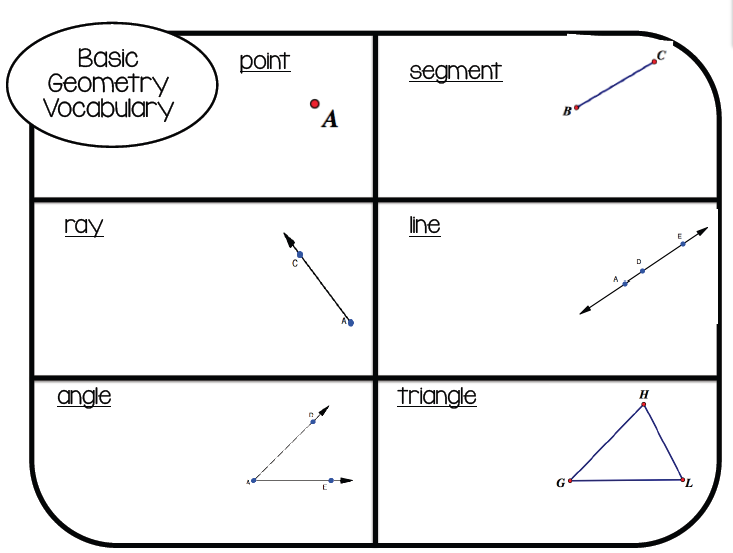 So, I decided to start small and try a graphic organizer for my first day of Geometry Honors notes. I had the students working on something else (factoring review) while everyone cut and then the glue sticks went around. As I gave notes, I actually think that the students enjoyed having some of the work done for them. It did make things go a little faster because they didn't have to redraw my diagrams. 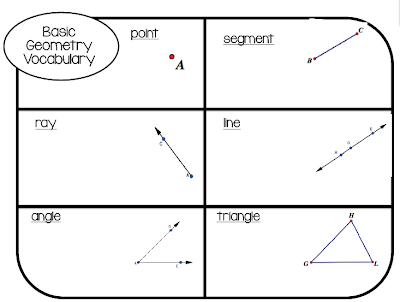 (Although part of geometry is drawing the diagrams!) Also, it did help keep the students' notes organized - everything I wanted to say fit in a specific box. They should be able to go back and re-read their notes and understand what goes with what. Yes, it's finally time for the Back to School Sale! Please link up here with your favorite middle or secondary school activity. Please limit your post to 2 paid and one free item. If you haven't followed my blog, I would sure appreciate it! I am the department chair at my school and we are looking to start using iPads next year schoolwide. We are really working on finding ways to use iPads in the classroom and to improve our communication with students and parents. 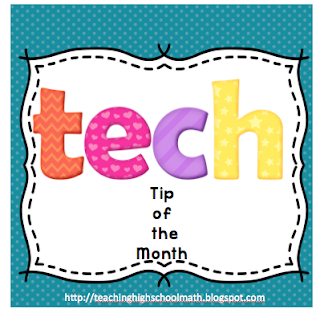 So, I intend to try to provide a "Tech Tip" of the month to the members of my department. Tomorrow, since it is our first department meeting of the year, I am going to try to get everyone excited about using QR Codes. 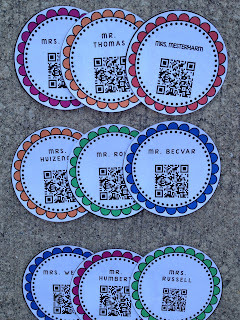 I am going to give each person a little welcome back tag with their name and QR Code on it. If I would have thought of this fabulous idea earlier, I would have attached the tag to a little welcome back gift. I know they won't all have a QR Code Reader installed on their mobile device, so I am going to show everyone how to do that and how to use and create a QR Code. I am hoping that they will be as excited as the students are to see what the QR Code says! 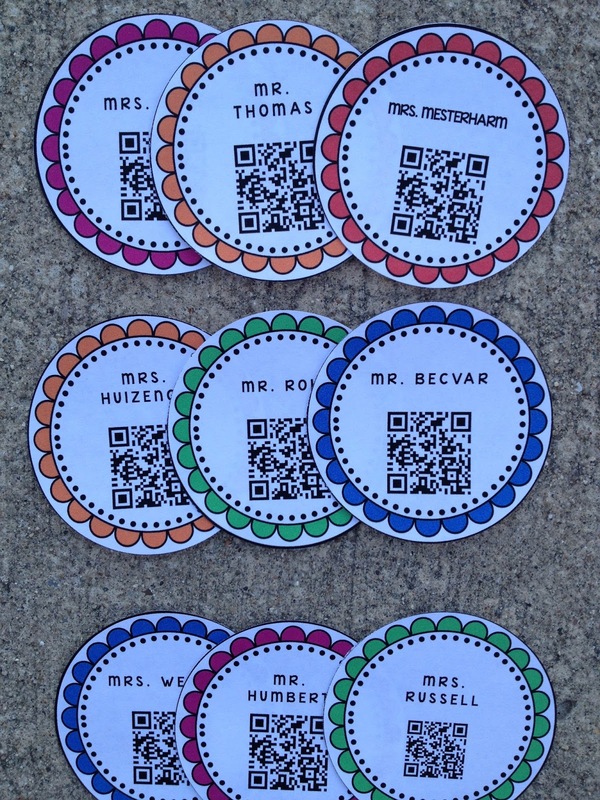 Then, I want to show how I am using QR Codes in my classroom. 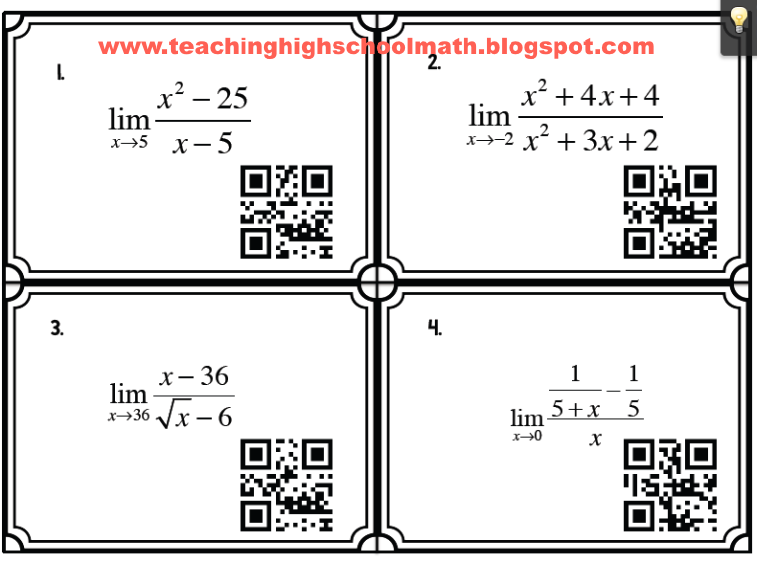 I have made several different types of Task Cards with QR Codes on them. In addition, I have had students scan a QR Code when they come into the room so they can get the answers to their homework. 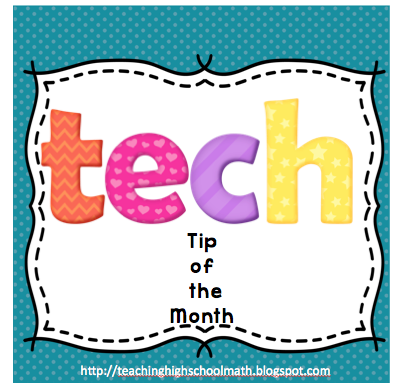 I am hoping that after I show the "Tech Tip" of the month, that other people in my department will develop other fabulous uses of QR Codes. What do you use QR Codes for? Homework - I feel like math students need homework - they need to practice things I have taught them. They need to try it on their own without watching me do it. 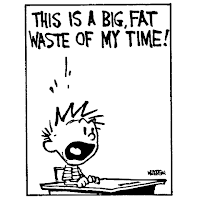 How many of us have had students say - I totally get it when you do it, but I am really stuck on my own. 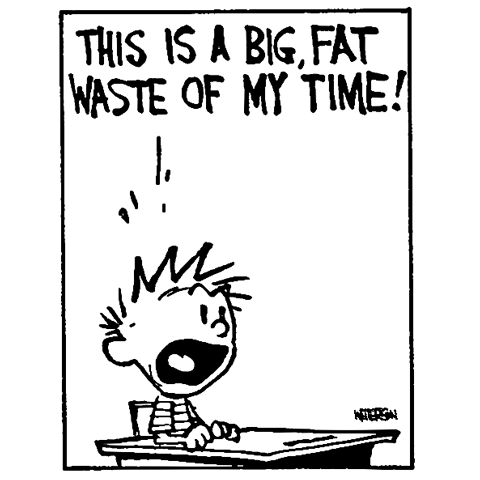 And the truth is...I hate going over homework. I don't mind explaining things that kids that really tried didn't get, but I hate reading all the answers and then doing problems for people that didn't try anyway. Ughh...it's a struggle. What I usually do is walk around the room and give students 5 points for having an attempt at every problem in front of them. If they don't do their homework at all, I give them 0 out of 5 points. They can earn somewhere between 0 and 5 points by having some of their homework. I like this method because it rewards kids for doing it without me having to collect a whole bunch of papers that I don't really have a lot of time to deal with every single day. However, it also doesn't separate out the kids that copied and the kids that actually did everything. 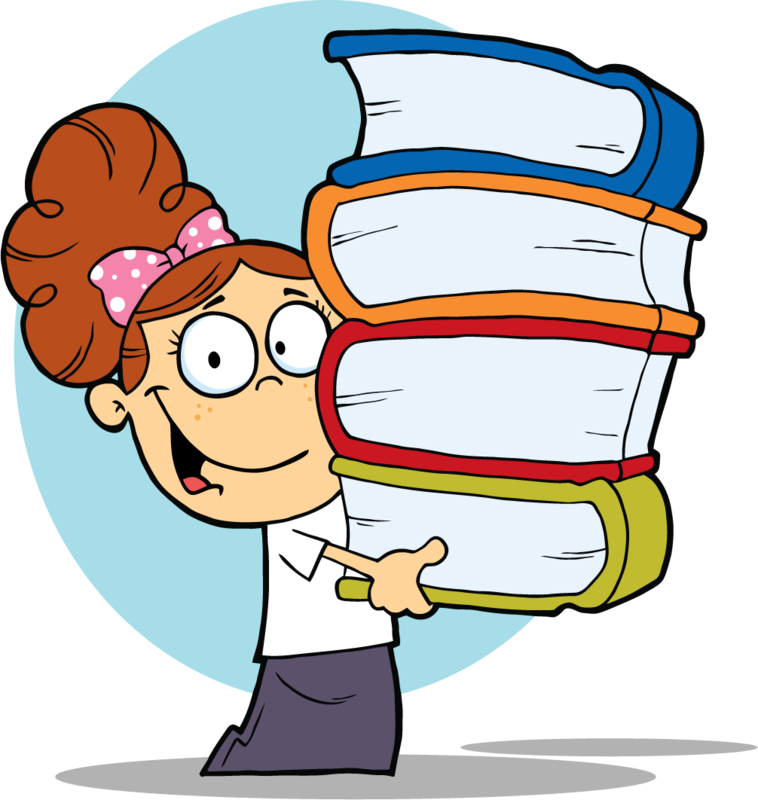 I have always figured that the kids that actually do the homework will do better on test day and it will all get separated out in the end. So, I put the question to you blog readers...help me get the year started right. 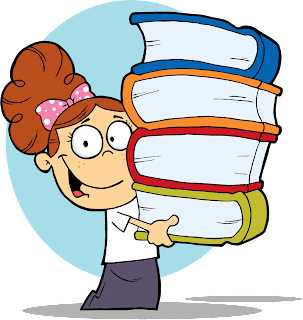 How do you encourage and deal with homework in your middle or high school math classroom? What Does Your First Day Look Like? What does it look like at your school? Well, our first day is with the freshmen trying to get them acclimated to the building and each other. The first day with all the kids is only a half day - each class gets 30 minutes. You have time to give the syllabus, call for attendance, and maybe pass out a book. But, what can be done differently, what can you do to say you mean business - that this class will be about math, and we're all going to LOVE IT! 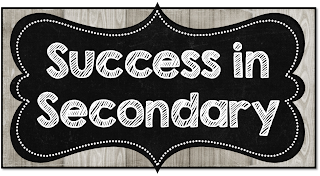 I think I am going to try a couple of activities that I found on several blogs...(see Amber Caldwell Blog). I usually have my calculus students email me with things they think I should know about them and what their goals are for this year. I do this for two reasons...1. I want them to know my email and that I will respond to their emails and 2. a lot of them ask me for letters of recommendation and sometimes the emails really bring out important information that they would never reveal during a real-life conversation. But, this year I am going to try to incorporate a little twist to it...choose 5 numbers and tell me why those numbers are important to you. For example, I might say 3 is important to me because I have three children. Or, the number 23 is my favorite number because Ryne Sandberg (my favorite baseball player) was number 23. But, in geometry, what can I do on the very first day to get everyone excited...make them want to come to class just to see what I'm going to do tomorrow? I was thinking of doing something with QR codes, but I know that lots of kids won't have a QR Code reader on the very first day, so I need something else. I found this idea about a cube, also on Amber Caldwell's blog. You give each group a cube net and have them design the sides of the cube. Then you cut it out and tape it together. Then the cubes are redistributed and the new group has to recreate the cube on the net without taking the original cube apart. This is great for me for two reasons. 1. I put my geometry students in random groups at the beginning of the year. The class is a mix of freshmen and sophomores, so they don't all know each other. Since they will spend the entire first quarter with this group, it is a nice, non-threatening get to know my group kind of activity. It will be interesting to walk around and see what kind of leadership emerges. 2. It's a great first day activity that actually involves geometry! What do you do on the first day of math class? How Do You Make Your Classroom Look Great? 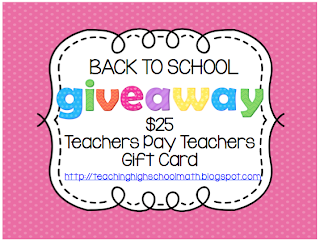 What could be better than winning a $25 gift certificate right before school starts - don't forget to enter my Back to School Giveaway...it ends soon! 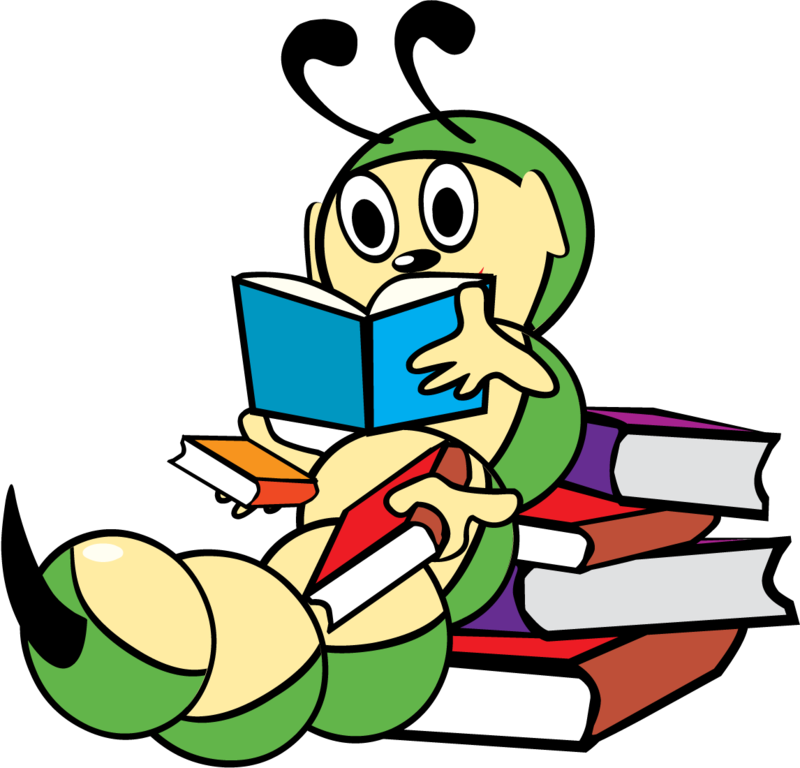 Keep reading and you can also find out how to get a cool math poster! So, I really want to make my class more interesting and exciting this year. I think, in general, the kids I have in class like coming to my class, but I want them to really want to come each day, just to see what we are going to do next! I think that starts with making the room exciting in a visual way. I shared this on another blog in a comment, but then I thought -- I'm going to expand on that in a post myself. At my school, as a veteran teacher, I get observed once a year by one of the three assistant principals. 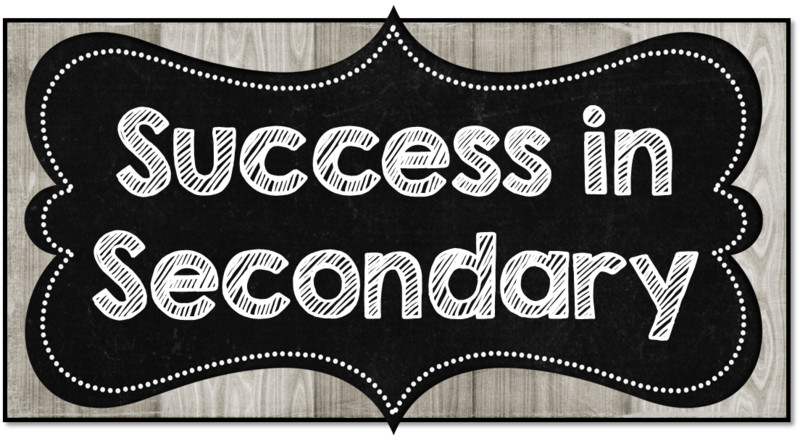 Last year, I gave what I thought was a very good lesson, and was fine with going in to talk to the assitant principal during our post conference. 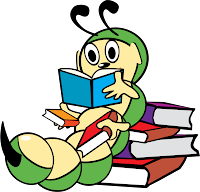 But, after doing a little more reflection over the summer, a small voice inside me said - hey what CAN I do to make this place more exciting? So I have a couple of ideas, and I am open to others that you may have. One thing I am going to do is put up a big math crossword puzzle that I found. I wish I could tell you where I found it, but I have had it in my file for a long time, and I just don't know. I think I found it in some kind of math calendar that I had a long time ago. Anyway, I took it to Staples and had them enlarge it to 18 x 24. I will hang it on my front bulletin board. I'll encourage kids that get to class early to see if they can fill in a clue or two before class starts. 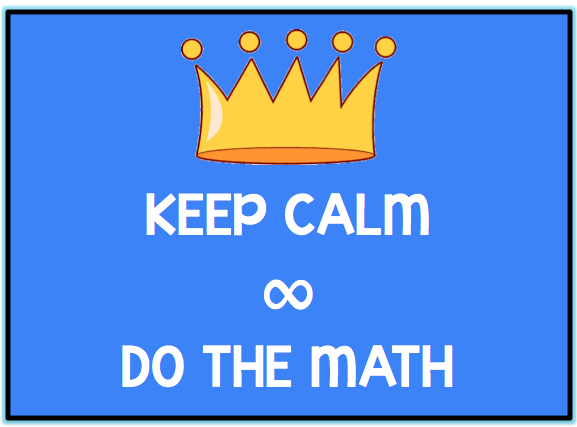 The next thing I am going to try is putting up a funny math joke that I get from the internet, or that I design myself. I will try to have it at least sometimes have to do with the day's lesson. Right now I have one that I designed for free on my facebook page. If you like me on facebook, you'll be able to grab this poster for free. (After you like me on facebook, go to the free math resources tab and click on it. Click the image and that will take you to the google doc where you can get the poster.) Be on the look out, I'm sure that I will make more posters to share as the year goes on. 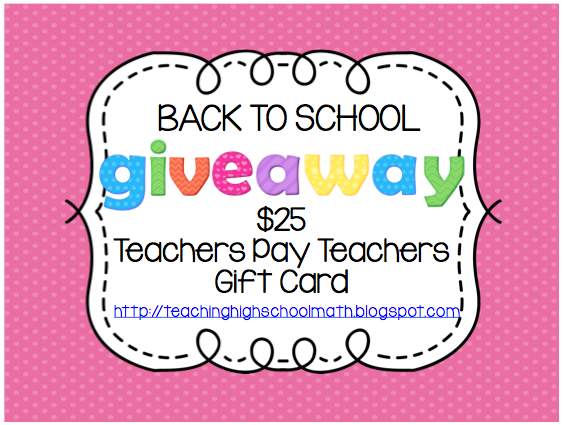 Don't forget to enter the giveaway - see the post below!